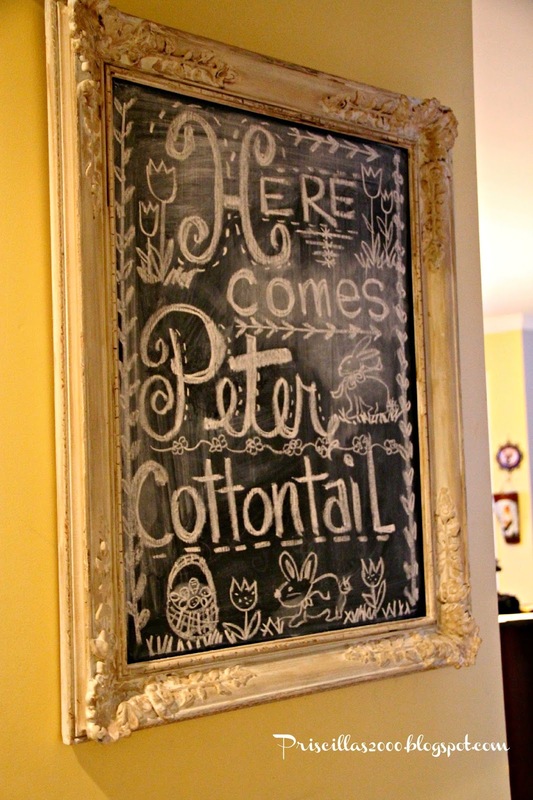 I did a little Easter doodling on the big chalkboard in the kitchen this morning .. This is what I came up with for Easter ! I love this chalkboard so much , being able to change it up for the seasons .. I got this frame at a garage sale , (very cheap!! 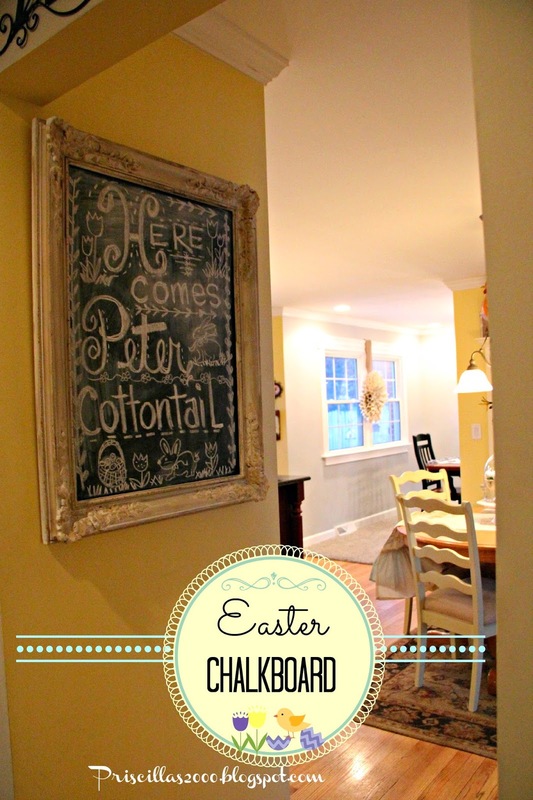 )..had a board cut at home depot and painted the board with chalkboard paint. At least spring is here inside the house ! 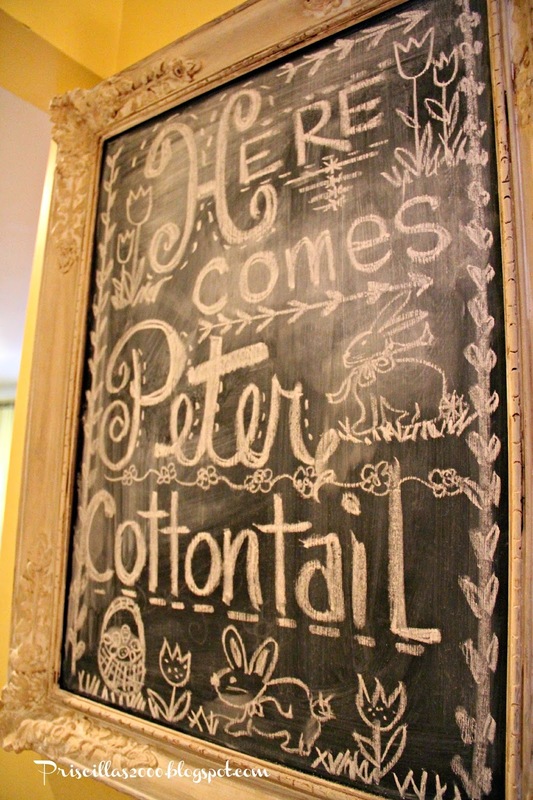 Love that chalk board, you decorate it so cute! 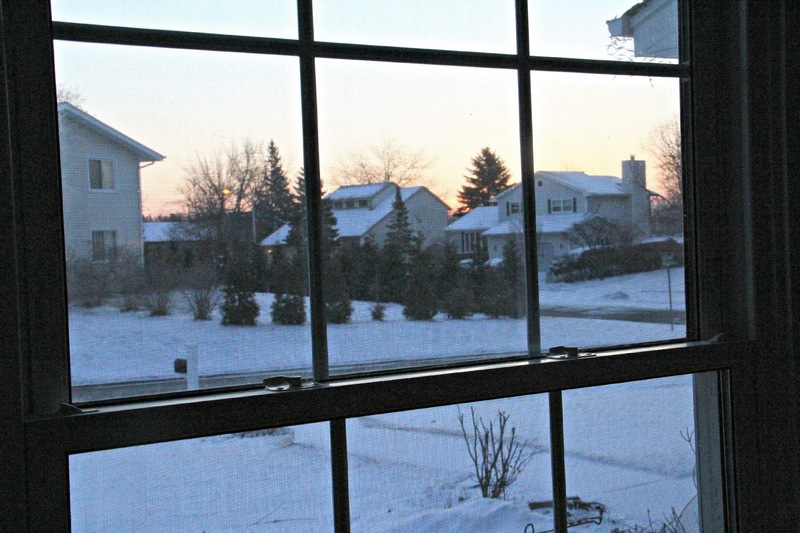 Snow, WOW, Spring has a funny way of tricking us, doesn't i? You are the Chalkboard Queen. Such great ideas and your handwriting is pretty AWESOME!! I love what you can do with old frames at cheap prices these days.. Have a great day.. Blessings! 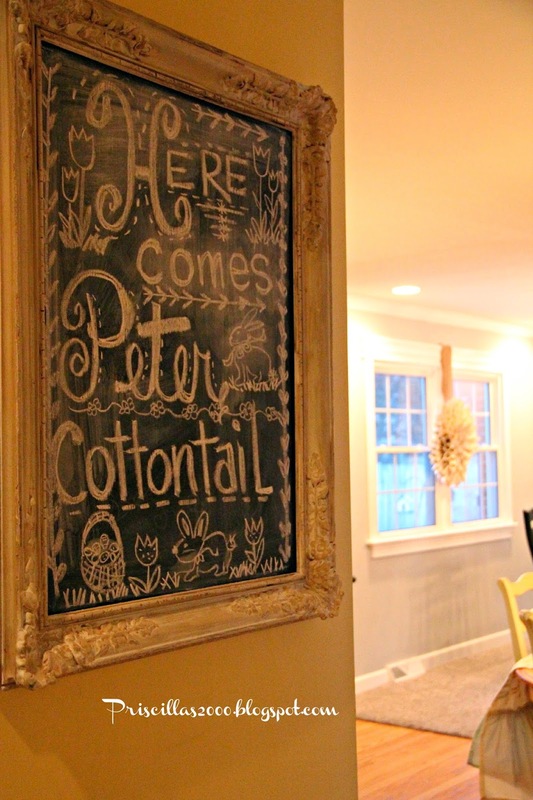 You have done so many great things with chalkboard paint! I love the Easter designs. 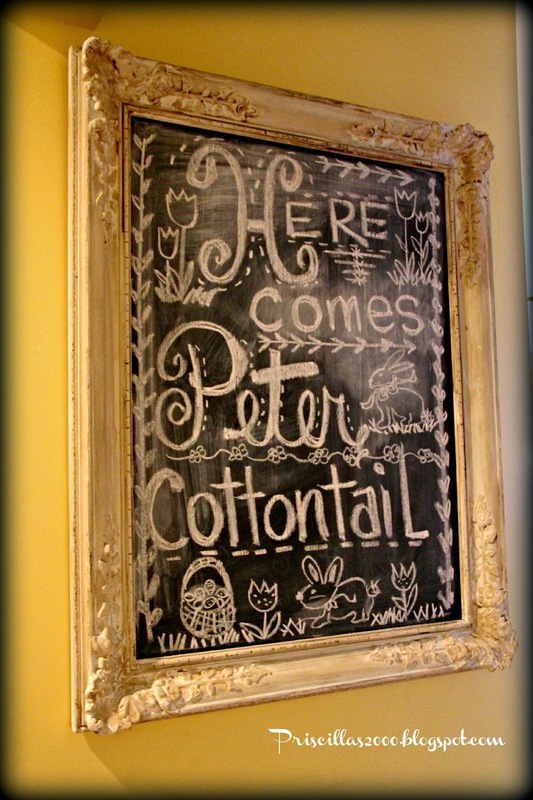 I'm always so impressed with your chalkboard drawings, Priscilla! 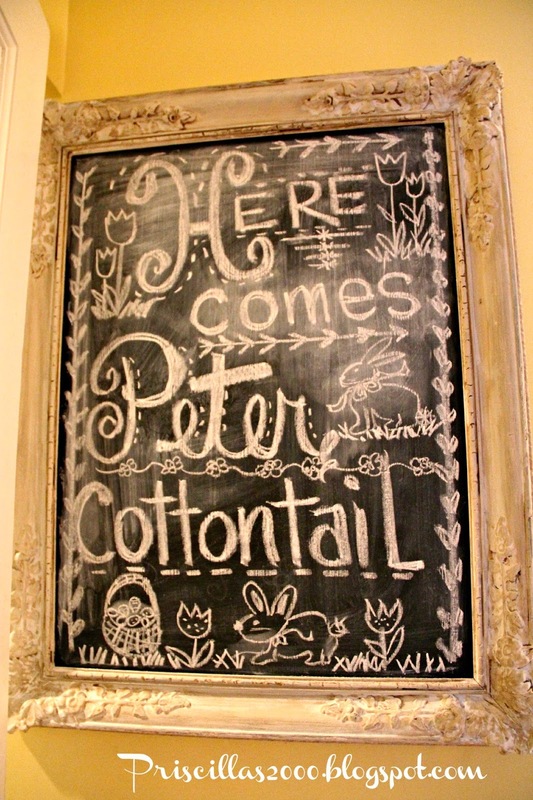 I can't even draw a stick figure so I truly admire people who can draw well :) Love the Peter Cottontail board! Love your chalkboard drawing, very clever. Love your chalkboard, Priscilla! What a great frame. I love where it's placed so you can really have some fun with it. This is so adorable! I'm pinning it. Thank you for the fun idea! Darling - makes me want to transform ours into one too! Very nicely done! I love the chalkboard. I love your chalkboard. What a creative artist you are! I have several vintage frames that I want to pick from to make a chalkboard for my kitchen. I might try the sticky vinyl chalkboard that is available. Just ordered some for another project so I will see how it works! Poor Peter must be hopping down the ski trail! Love your chalkboard art. I like how it looks like glowing gold. I don't know if it is the lighting or the color, but it's pretty! Thanks as always my friend for linking up at Twirl and Take a Bow! Brettons 2nd Birthday Truck Cookies !